Note the installation of the "+" and "-" poles The battery uses three "AA 1.5V" batteries (not include). 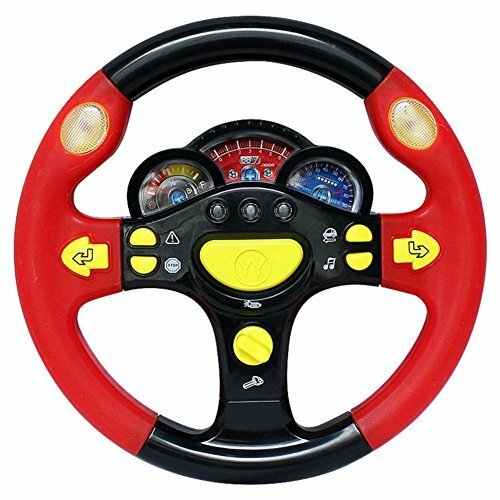 The easy-grip steering wheel is based on the design of Formula 1 steering wheels and the stylish colour scheme makes this a real design feature. By pressing the buttons, which have been designed especially with little fingers in mind, those little drivers will be amazed and delighted to hear the real sounds that "big" vehicles make. The On/Off button is pressed to start the wheel. As soon as this has been operated, the sound of a starter motor can be heard. The indicator on either the left or the right hand side can then be operated by the touch of a button and the familiar indicator sound can be heard. After a quick glance over the left or right shoulder to check that the road is clear, the exciting journey can begin. A relaxing ride requires the right type of music and this can be played by pressing the radio button. The cheerful BIG-Bobby-Car song will get all those little drivers singing along. And when the driver in front hasn't noticed that the traffic light has turned to green, then the horn can be pressed to get his attention. If there's a queue ahead, then the drivers behind can be alerted to the cars in front by switching on the hazard warning light, which is concealed behind the realistic triangular-shaped button. Now all we've got to do is phone home and tell mum we'll be a bit late for tea. If you have any questions about this product by CCXZXF, contact us by completing and submitting the form below. If you are looking for a specif part number, please include it with your message.